Over the past few years, hundreds of primary schoolers have enjoyed our holiday sessions that inspire them to care for the ocean – now it’s time for the high schoolers to get in on the action. Due to popular demand, our Marine Biologist for a Day program has been adapted to cater for an older audience who want a more in depth look at the world of marine science. Students will have the chance to examine in detail our impact on the ocean including environmental stress on coral reef systems, water acidification and plastic pollution. We will discuss a wide range of ideas on how to better care for the health of our seas. The aim of the program is to making learning fun and relevant, examining animal classification to discover how each creature fits into the aquatic world. The program will be very interactive, with students observing the dissection of a dead fish to reveal the organ make-up and development of a mullet. And our most popular feature will still be included – the chance to gently touch our living sea creatures – an opportunity that never gets old at any age! This program will provide a valuable insight to the workings of the aquatic world for any high schooler who has a passion for the ocean or is considering a career in marine sciences. But we haven’t forgotten the younger students – our classic Marine Biologist for a Day will still be running in school holidays – we’re just expanding the program to grow with your kids. This entry was posted in Get involved, Holiday Program, Promotions and tagged careers, Marine Biologist for a Day, marine biology, marine education, Ocean Life Education on September 6, 2018 by oceanlifeeducation. 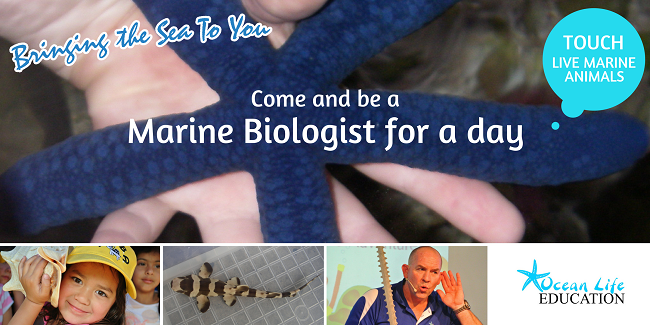 Become a Marine Biologist for a Day and be immersed in a full day of marine science! Our new full day program for school aged kids is perfect for those passionate about marine animals and ocean conservation. In Marine Biologist for a Day, our aim is to educate kids with the right information based on science to create informed, future custodians of the ocean and all its wonderful creatures within it. Learn what problems humans create for them and why we need to look after them. Marine Biologist for a Day will be an experience they will never forget! Marine Biologist for a Day is suitable for students in Grades 2-5. The program is limited to 25 students so they can get the best learning experience. Parents are invited to arrive half an hour before the conclusion so they may be educated by their children, giving the kids a chance to show off the wealth of new information they have acquired. Parents will be amazed just how much their kids remember. Spaces are limited, bookings essential! This entry was posted in Holiday Program and tagged holiday education, holiday programs, kids marine program, marine biology, marine education, Marine Studies, school holiday activities, science activities on January 30, 2017 by oceanlifeeducation. We’re introducing a new school holiday program for the upcoming September school holidays. The Weird & Wonderful Creatures of the Sea program is an opportunity for students to discover amazing facts about extraordinary sea creatures. This interactive program will intrigue students while teaching the important message of caring for our environment. Get up close and touch live marine creatures and explore artefacts and games. Students will be surprised at the diversity of bizarre looking creatures in the ocean! Contact us to book a Weird & Wonderful Creatures of the Sea program for your September school holiday calendar. This entry was posted in Holiday Program and tagged holiday programs, sea creatures, vacation care on August 4, 2016 by oceanlifeeducation. Ocean Life Education is blending science with humour these school holidays offering fun marine education programs to Outside School Hours Care centres across the Sunshine Coast and Brisbane regions. With a strong focus on pollution and how humans affect the environment, Ocean Life Education offers an exciting learning experience that will leave children with a greater sense of ownership and understanding to protect our natural marine environment. Director of Education, Richard Coward, says Ocean Life Education’s Holiday Programs are a great way for all age groups to learn about relevant issues whilst having a fun and interactive experience. “We create our vacation care programs with all age groups in mind so each child can have an enjoyable and memorable experience. “These Spring holidays we’re offering our Human Impacts program which covers topical issues such as plastics pollution and micro plastics, land clearing and over fishing and the impacts these have on our marine life and their environment,” Richard said. The Human Impacts program educates children on how everyday practices such as correct waste disposal and recycling can protect marine life and reduce our impacts such as the Great Pacific Garbage Patch. “It’s fantastic to see so many Outside School Hours Care centres across South East Queensland incorporating environmental education and the ocean into their program calendars”. Ocean Life Education has been established on the Sunshine Coast for over eight years bringing live creatures from the ocean into the school and early learning environment. 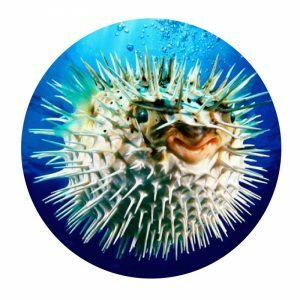 Children get up close and touch live marine animals such as sea stars, sea urchins, baby sharks and fresh water turtles and are fascinated by how these animals function and what part they play in our oceans and waterways. To book an Ocean Life Education program for your school, early learning centre or next holiday program phone 07 5443 8545 or visit www.oceanlifeeducation.com.au. Tracey Coward, Business Manager, phone 0404 455 690 or 07 5443 8545. This entry was posted in Holiday Program on September 18, 2014 by oceanlifeeducation.